SuperMansion’s third mid-season finale streams today on Sony Crackle entitled “The Long Chaun,” in it, the League of Freedom travels to the Godsrealm to save former member Zenith (Yvette Nicole Brown) from her evil Uncle Ridan (Taran Killam). Robobot (Zeb Wells) learns what it means to be a real boy as Titanium Rex (Bryan Cranston) must prove to be a hero true in order to wield the Sword of Azimuth. Already announced was Minnie Driver joining the cast when the third season returns, but we won’t actually have to wait that long for a new episode of SuperMansion. That’s because the just announced “SuperMansion: Summer Vacation Special,” will debut Thursday, August 16, 2018 with an exclusive starting Monday, August 13, 2018 on PlayStation 3 and PlayStation 4 through the Crackle app. 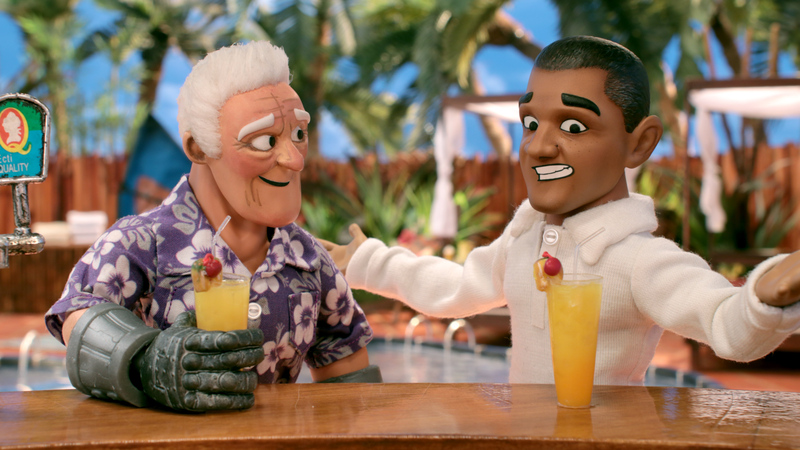 In the upcoming summer special, the team heads to Hawaii where Titanium Rex (Bryan Cranston) runs into a vacationing former President Barack Obama (Jay Pharoah), Black Saturn (Tucker Gilmore) and Lex (Jillian Bell) teach Cooch (Heidi Gardner) how to swim, and American Ranger (Keegan-Michael Key) attempts to perform in a USO show while an evil threat brews under the sea. Check out preview stills below for today’s episode streaming on Sony Crackle along with a still from the upcoming Summer vacation special up above.